Light box therapy: Can it alleviate SAD and winter blues? Can light therapy make it easier to get through the darkest days of winter? 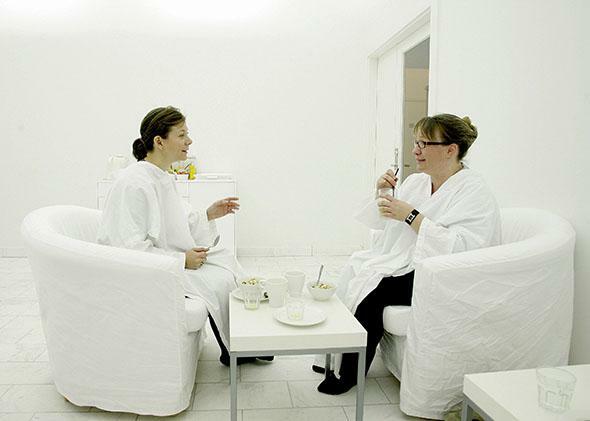 The Light Cafe in Stockholm shines artificial light on customers to help boost mood during dreary winter months. Tips for beating the winter blues are as numerous as the December night is long. Light boxes, touted to “uplift people’s spirits” and “improve mood and energy,” offer one new-agey-seeming solution to propel us out of our extra-spacious sweatpants and into the dreary cold as if it’s the first beautiful day in spring. But can sitting in front of a light for a few minutes a day actually counteract the dreariest months? Yes, in many cases. Light-box therapy has been shown to alleviate symptoms in people who suffer from seasonal affective disorder. SAD is a form of depression that meets criteria spelled out in the Diagnostic and Statistical Manual-5. Symptoms can include lost interest in beloved activities, overeating, loss of energy, disrupted sleep cycles, and feelings of hopelessness or guilt, among others, and they typically appear in late fall or early winter and dissipate in the spring. Women are two times more likely to seek treatment for SAD, and those farther away from the equator’s glow are also more likely to be diagnosed: About 11 percent of Mainers have a clinical SAD diagnosis, but only 2 percent of Floridians report the illness, according to Kathryn Roecklein, assistant professor of psychology at the University of Pittsburgh. One tool doctors use to treat SAD is light-box therapy. Light boxes use bright white fluorescent bulbs (or sometimes blue light) that reproduce some wavelengths of the sun’s light. They contain filters to block harmful UV rays and come in various shapes, sizes, light types, and price points. Scientists know light hitting the retinas in our eyes can directly increase alertness and positive moods and can synchronize circadian rhythms, but they don’t know which of these actions is behind light-box therapy’s effectiveness. Generally, doctors recommend sitting in front of a light box for 30 minutes each morning, when the treatment has been found to be most effective. Most light boxes emit 10,000 lux (a measure of illumination), though some inexpensive models crank out only 2,500 lux. A sunny day measures about 50,000 lux, while light in an indoor room typically measures no more than 400 lux. Side effects are rare and minor, though those with diabetes and eye problems are at greater risk of eye damage, and some studies suggest an increased risk of manic episodes among those with bipolar disorder. Light-box therapy typically alleviates symptoms of SAD within a week, but symptoms return if a person stops regularly using the box. Studies show roughly one-half to three-fourths of people, depending on remission criteria and case severity, with SAD report that their symptoms decrease when using light-box therapy. (For comparison, about one-half of people using antidepressants report a drop in symptoms.) Doctors might also prescribe medication or use cognitive behavioral therapy tailored for SAD either in conjunction with or instead of light box therapy. Unlike light-box therapy, cognitive behavioral therapy, which seeks to modify a person’s thought patterns to improve coping, has been found to last through several seasons, Roecklein says. But what about those for whom winter doldrums make it extra difficult to go to the gym or haul themselves out of a warm bed but whose symptoms stop short of SAD? Light boxes can be effective in “subclinical” SAD, but it’s still best to consult a doctor before handing over your credit card. Timing, duration, and intensity are all variables in light-box use, and Roecklein says those who try it without first seeing a doctor may not understand how to make it work for them and conclude it isn’t effective, so the light box ends up stashed in the closet alongside that unused Bowflex or Shake Weight. As with your bedroom lamp and awful office lighting, the tanning bed is also a terrible stand-in for a light box. Exposure to harmful UV rays, which aren’t filtered out as they are in most light boxes, greatly increases the risk of skin cancers. Plus, as Roecklein points out, tanning-bed users cover their eyes with goggles, which block what research shows is the pathway to alleviating SAD symptoms.